Why was I carrying a big bowl of chopped up fruit down the street today? Because it was office potluck superfun times and I didn't remember until late and cutting fruit into bitesized pieces is my favorite style of cooking. Hot tip: add mint and lime juice to your next fruit salad! What else? I have been working odd hours, and going to talks and getting my hair cut. My stylist doesn't even ask what I want done anymore. Instead I try help her figure out what her contribution to disaster preparedness might be. I think it lies in preparations for the eventual recovery, because who wants to be on national television looking like a dirty cannibal? Yes, I did see Harry and the Potters twice in one week. Why? Because they are awesome. Also because their enthusiasm for reading and rocking manages to make me happy and the earnestness of their crowds is hilarious. Sometimes they rock so hard that one of them gets electrocuted by the building. 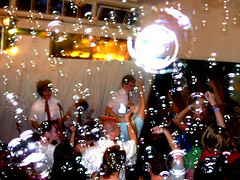 And they bring along a bubble machine, a keytar, and a tenor saxophone to their performances. On Sunday, they were at 826Seattle. So were Samantha [blogspot], Steph, and Ryan. And a bunch of wizardy teens, some of whom waved wands along with the rock and roll. Not to mention a pack of teenage boys with rolled-up jeans who took several opportunities to start a miniature mosh pit and spent much of the performance planning just the right moment to take off their shirts. They broke the door a little bit. My guess is that they are the least nerdy kids in their gifted and talented class. While I was waiting outside for people to show up and doors to open, I tried to convince some guy from the Pig & Whistle to start a band based on Dune. I don't think I was very successful. Q. Finally, How much do we love John Hodgman on the Daily Show talking about net neutrality? A. so much it hurts a little bit. I was waiting outside eating baba ganoush out of a styrofoam conatiner and the host/waiter from the bar/restaurant came outside to see what all the commotion was about. I explained that it was a rock band that played songs about books. He vaguely liked the idea, but hadn't read the Harry Potter series. He said that he liked Dune a lot and was a musician himself, who liked the idea of commissioned [or something] art; so I kept telling him to start a Dune band whenever he didn't like something about Harry and the Potters (e.g., that they dress up like hybrid english schoolkid rockers instead of cape & hat magiciany).